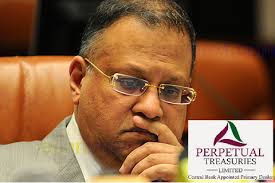 It is reported that the purchase of other institutions or the use of monies, lying in the bank account, belonging to the Perpetual Treasuries Company of Arjun Aloysius, who has been accused of being involved in the Central Bank Treasury Bond scam, has been banned. On the instructions of the President, using the money in the Bank Account for other institutions has been prohibited. Meanwhile, it is reported that withdrawing money from that account has also been restricted. Sources connected to the President's office said that, the Central Bank of Sri Lanka is keeping a strict watch on the deposits and withdrawals of this particular account.